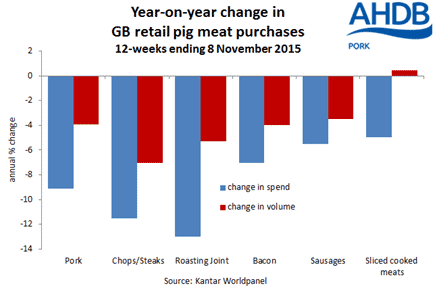 UK - Over the 12 week period ending 8 November 2015 the volume of pork retail sales continued to fall with 560,000 fewer shoppers buying than a year earlier according to Kantar Worldpanel. Combined with average prices falling as a result of a drop in the base price and even though there were slightly fewer promotions, this has reduced total expenditure. Chops and legs were the biggest drivers of the volume decline, although pork steaks registered small levels of growth within the period. Similar to other proteins pork mince has seen growth, with a 5 per cent increase in volume, but with prices falling total expenditure was still down. The only other area of growth has been within ‘pork other’ which consists predominantly of marinades, with greater household penetration and a higher volume purchased per trip. There has been a 4 per cent decline in bacon volumes over the same 12 week period, despite a fall in price, mainly due to shoppers switching to other products and buying less. Low-fat sausages was the only category which has seen gains over the last 12 weeks. There is evidence that health is becoming a bigger driver for consumers, with a recent YouGov survey showing 34 per cent of respondents are looking to reduce saturated fat levels in their diet. Meanwhile, ham volumes have remained stable, with average price reductions lowering total expenditure, with switching evident from loose to prepacked products.